Go paperless with PECU’s secure e-Statements. It’s free to switch to e-Statements and free to use them. PECU’s e-Statements help you manage your account easily while reducing the paper cluttering your house. Reduced paper use helps the environment. When you go paperless, you still have access to your past 18 monthly statements online and you can view the same information online that is on your paper statement. You’ll receive a monthly e-mail notification when your new statement is available online. It’s easy to set-up e-Statements as a clickable choice within e-Branch. 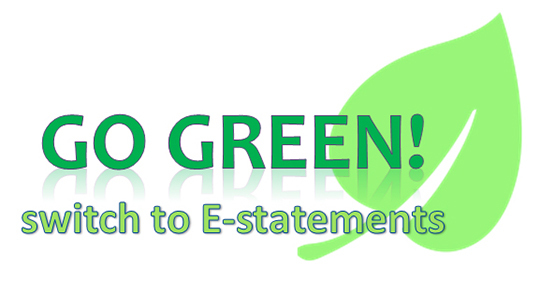 It’s a green thing, and you can do your part by choosing PECU’s free, secure e-Statements! Within 1-4 weeks you will no longer receive paper statements.